The home media server received a lot of attention last year. A walk down the exhibition aisles of both CEDIA and EH EXPO in 2005 demonstrated how popular this category of products has become as the number of manufacturers with media center product introductions seems to double each year. 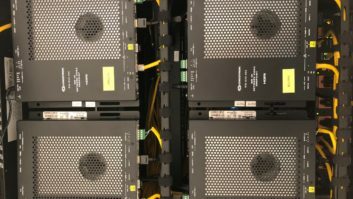 As appealing as the prospect of a centralized digital media server product is for our clients homes, however, one of the greatest challenges they face is how easily they can store, edit, transport, control, and view their high-quality video content with these new media servers. This is especially challenging when our clients try to move their tape-based home personal-recorded videos to the media server hard drives. Typically these video recorders have to be physically attached to a media server over a Firewire port and then software on the media server computer captures the audio and video feed streaming from the camera and encodes it into a digital format that can be stored and played back from the media center hard drive. This type of video encoding and editing is a cumbersome and time-consuming process, especially if one is trying to do this on a media center computer which is located in a family room next to a large screen television instead of from a home office computer which is more conducive to keyboard and mouse-based interaction. Hard drive-based video cameras provide the optimal solution to this digital video storage and transport issue. Just as weve seen the transformation of film-based still cameras to flash card-based digital cameras and VCRs to digital video recorders (like TiVo), we are now beginning to see the emergence of home-based video cameras centered on hard drive technologies instead of tape. One of the first entries into this new field is a product line from JVC, called the Everio G Series. I purchased the Everio GZ-MG30 about a month ago (for $750) and it has been a great addition to not only our own digital home, but it has become an essential tool that we now use to video document our custom installation work. The greatest benefit of this product is that the digital videos captured and stored on its 30GB hard drive (which can hold up to seven hours of high-quality video) are immediately transcoded into an MPEG2 format which now can be easily transported over a USB 2.0 cable to any computer in the home. Once connected to a computer, these videos can be copied into any folder on the home network for review and editing, including the media center computer in the family room. I have begun taking some of these videos and posting them to our personal FTP site so that others can easily download and view them. This process of recording, storing, and reviewing digital videos now closely emulates what digital cameras have been able to do over the last half dozen years. Professionally we use the camera to document all of our installations from pre-wire to finish trim to final installation. We used to document this work with a digital camera but our new JVC digital video camera captures much more valuable information about our client sites. For example, when we do a pre-wire we will walk through each room of the home, taking video of our wire runs while explaining what room we are in and what wire has been run. These room-by-room videos are then stored on our company server and sorted by client installation. Whenever anyone in the office needs to retrieve this video information from any computer on our network it is as easy as loading a word or photo document to his or her desktop. In fact, weve taken this technology one step further by transcoding the MPEG2 videos captured with the camera into MPEG4 videos that can be stored on the new Apple video iPod. We now take final walkthrough videos of our client installations with the JVC digital video camera and store that video content on our Apple video iPod to demonstrate cyberManors custom installation capabilities to our potential clients when we are on the road. At this point our video iPod emulates the capabilities of a home media server (albeit in a much smaller form) and demonstrates the value of the media server concept to potential customers. Its clear that with products like the digital video recorder from JVC and the Apple video iPod we are seeing a growing ecosystem of products that allow us to easily record, transport, and view video content in the home. The success of digital audio in the home is now being followed by a wave of digital video products. These solutions are best implemented and enjoyed in large new homes with many large, flat screen televisions, speakers in every zone and terabytes of server space. That sounds like a great potential new custom installation client to me!